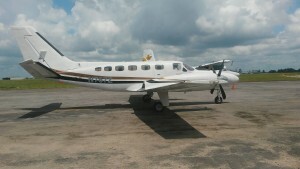 The illegal aircraft currently at Air Station London, Guyana Defence Force Air Corps. The Guyana Defence Force (GDF) said the illegal aircraft (Reg # N767Z) that was recently discovered camouflaged at an airstrip in Yupukari, has since been repaired, and was flown from Yupukari to Lethem initially, before arriving at the Cheddie Jagan International Airport (CJIA) at 10 O’clock Saturday morning. Aeronautical Engineers of the Guyana Defence Force (GDF) Air Corps, after inspecting the aircraft, had identified the problems which had rendered it un-serviceable. “The necessary spares were sourced, and the repairs conducted, resulted in the aircraft becoming operable,” the GDF added. The GDF further stated that the aircraft was subsequently flown by GDF Pilots to Lethem on Friday, September 30th where it overnighted. “This allowed for the GDF Engineers to conduct further repairs and functional checks under more favourable conditions, so as to ensure the aircraft’s suitability to fly to Timehri. Consequently, the aircraft departed Lethem for CJIA this morning at 0910 hours, and is currently secured at the GDF Air Corps Hangar, Air Station London, CJIA,” said the Defence Force. President David Granger has since ordered a Commission of Inquiry into the presence of the aircraft in Guyana and whether the law enforcement agencies could have done better in information and intelligence sharing. “Investigations are ongoing with regards to all aspects surrounding the discovery of the aircraft,” the GDF said. Guyanese authorities have already confirmed that the US registration number that the Cessna plane is bearing is fake.No drugs, ammunition, weapons or other illegal items were reported found aboard the plane.